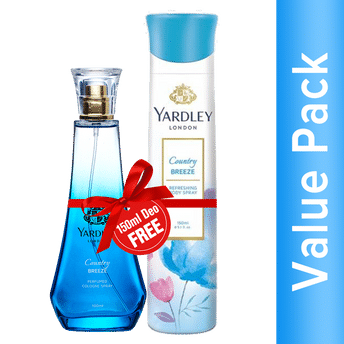 Country Breeze -a Perfumed Cologne Spray from the house of Yardley -is crafted to celebrate the individuality of the woman of today. The fragrance is made of layers of rich notes, unfolding to reveal a sublime and delicate experience, with the perfect blend of strength and softness. Country Breeze takes you on a mesmerizing journey through the fresh fragrances of English meadows with its top notes of mandarin and bergamot, heart notes of jasmine and freesia, and base note of musk.